(CNN) -- As the summer swim season starts Memorial Day weekend, water quality and health experts have a message for swimmers: Please don't pee in the pool. About one in five adults in a survey reported urinating in community pools. Although urine in the water probably will not cause swimmers to go to the emergency room, it causes "more of a respiratory, ocular irritation: the red puffy eyes or a cough, an itchy throat," said Michele Hlavsa, an epidemiologist in the division of parasitic diseases at the Centers for Disease Control and Prevention. "A big health message is not to urinate or pee in the water." And it happens far more frequently than water-lovers would like to think. In a survey of 1,000 U.S. adults conducted in April and May, 17 percent admitted relieving themselves in a swimming pool. Even the Olympics' most decorated swimmer, Michael Phelps, confessed to urinating in the water to TV host Jimmy Kimmel. In a 2008 interview, Kimmel asked the 14-gold medal winner, "You pee in the pool, true?" "Which nationality pees in the pool the most?" Kimmel asked. "Oh, so we're number one in that too," Kimmel quipped. Sometimes, an indoor swimming pool will emit a strong chemical smell. 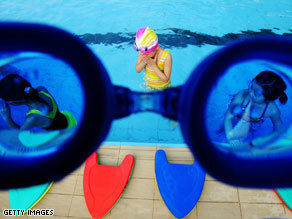 The swimmers have coughs or red, stinging eyes after emerging from the pool. Usually those symptoms get dismissed as the effects of chlorine, but their causes are something more organic. When swimmers sweat or urinate in the pool water, the bodily fluids combine with the chlorine. It creates chloramines, which causes the strange odor and the eye and respiratory irritations for swimmers, according to the CDC. No matter how discreet the act may be, "you're contaminating the pool. Let's face it," said Linda Golodner, the vice chairwoman of the Water Quality and Health Council. The survey released by Golodner's group, which advises the American Chemistry Council, found that 11 percent of the surveyed adults said they have swum with a runny nose, 7 percent with an exposed rash or cut and 1 percent when ill with diarrhea. The margin of error was plus or minus 3.1 percentage points. "With Crypto, if you have diarrhea, it's very watery," Hlavsa said. "It's not a formed stool sitting in the pool or floating on top. It could be very watery, and no one [in a pool] would know." The agency also recommends that people shower before a swim, because most people have traces of feces on their bottoms, which can contaminate recreational water. In the Water Quality survey, 35 percent reported skipping a shower before swimming. Melanie Arthur, a mother of two in The Woodlands, Texas, maintains a swimming pool where her children play. "We are going to great lengths to train our 3-year-old to not go potty in the pool but to get out and go inside the house," Arthur said. "After maintaining our own pool, I hesitate to go to public pools. I am certain that they are not nearly as clean as my own." Just practice good hygiene when going for a swim, Hlavsa advised. And remember, if you pee in the pool, you have to swim in it, too. • Look at the pool to see whether it's clean and clear, and the drain is visible. • Listen for pool equipment, because the pool pumps and filters should make noise. • Feel the tiles and pool sides. They should not be sticky or slippery. • Beware of a strong chemical odor. A well-chlorinated pool has little odor.